It's easy to fall into cooking ruts. 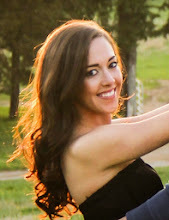 Life gets busy and you end up falling back on tried-and-true dinners (or grabbing something quick) most nights -- much simpler than creating something new and exciting. I get it. But making an effort at least once a week or so to try a new recipe and create something different allows you to discover all that the world of food has to offer (which is A LOT)...and it really doesn't have to take a ton of time or effort. 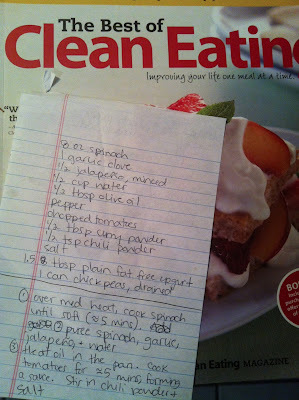 Just gather some fresh ingredients that you don't normally choose, find a new recipe (or don't follow a recipe at all! ), and see what you're capable of! For me, the inspiration for this new-and-different meal came as I was flipping through a favorite cookbook that I hadn't taken off the shelf in a while, The Best of Clean Eating. 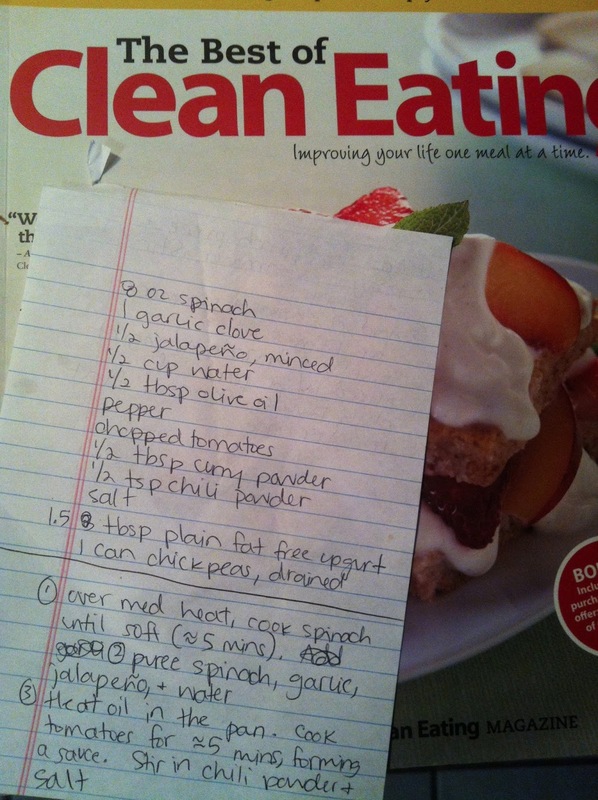 While the book has a plethora of fabulous clean eating ideas, it was a random piece of notebook paper laid between the pages with a recipe scribbled on it that I was excited to find. 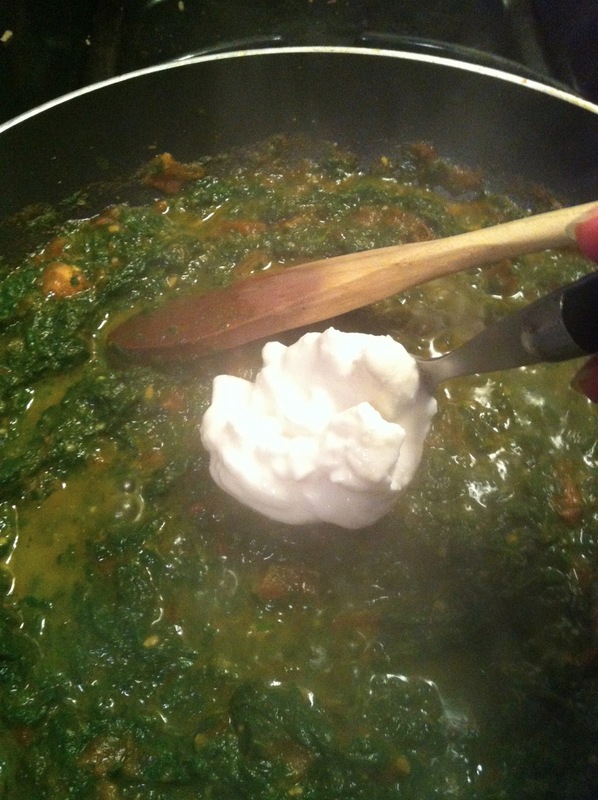 It is a recipe for chana saag that I wrote out about 3 years ago when I lived on my own after college and first started cooking. I had no idea where it originated from (although after a little searching it looks like I've found the source!) but I do remember making it way back then and loving it. I immediately wanted to make it again! However, I wanted it to be a little more substantial - why not add a crispy, Indian-spiced chicken thigh on top? Delish! Chana saag is a wonderfully nutritious and fragrant Indian dish with spinach, chickpeas, tomato, garlic, yogurt, olive oil... how could that be bad?! I cut the amount of chickpeas in half this time so it would be a little more spinach-y and less bean-y since I was serving it with chicken, but using the full can of chickpeas results in a lovely vegetarian meal that is pretty hearty on its own (see that original link). 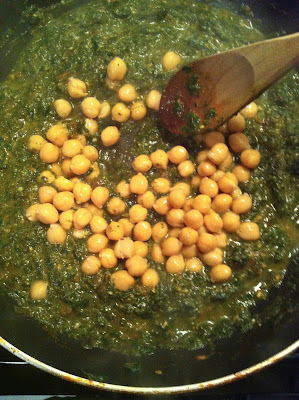 To make the chana saag: Saute 8 oz of spinach in 1/2 a tablespoon of olive oil over medium heat until soft. 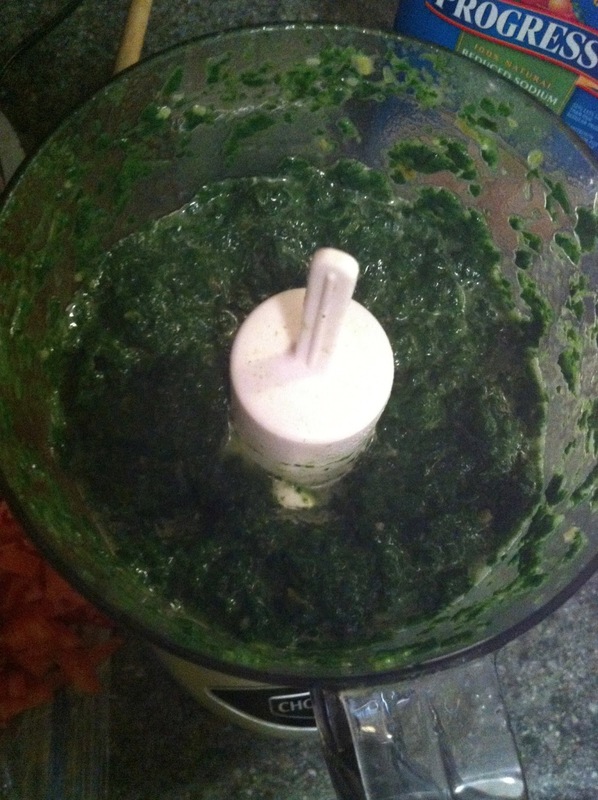 Pour the cooked spinach into a food processor and add a clove of garlic, a scoop of chopped jalapenos, and half a cup of chicken broth or water. Puree until smooth. Next, saute 1-2 chopped tomatoes in another 1/2 tablespoon of olive oil over medium-high heat for about 5 minutes, crushing the tomatoes as needed and creating a sauce. 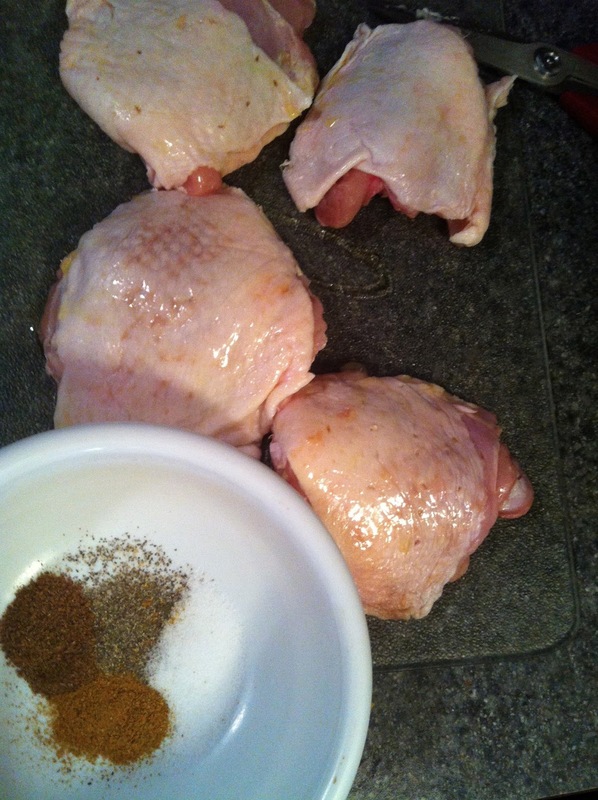 Stir in curry powder, chile powder, salt and pepper. Stir in the spinach puree. Bring to a simmer. Then, stir in about 1.5 tablespoons of plain greek yogurt (or regular plain yogurt). Yummm! Finally, add the chickpeas and simmer for about 10 minutes. 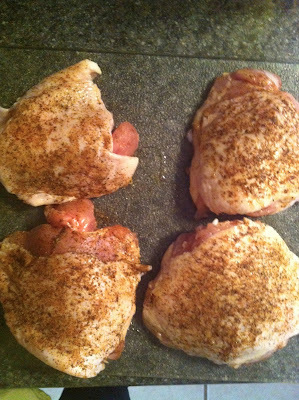 For the chicken, you need chicken thighs with the skin on, trimmed of visible fat and patted dry. Preheat the oven to HOT - 450 degrees. Rub with olive oil and season both sides of the chicken breast with curry powder, garam masala, salt, and pepper, focusing more of the spice on the skin side. 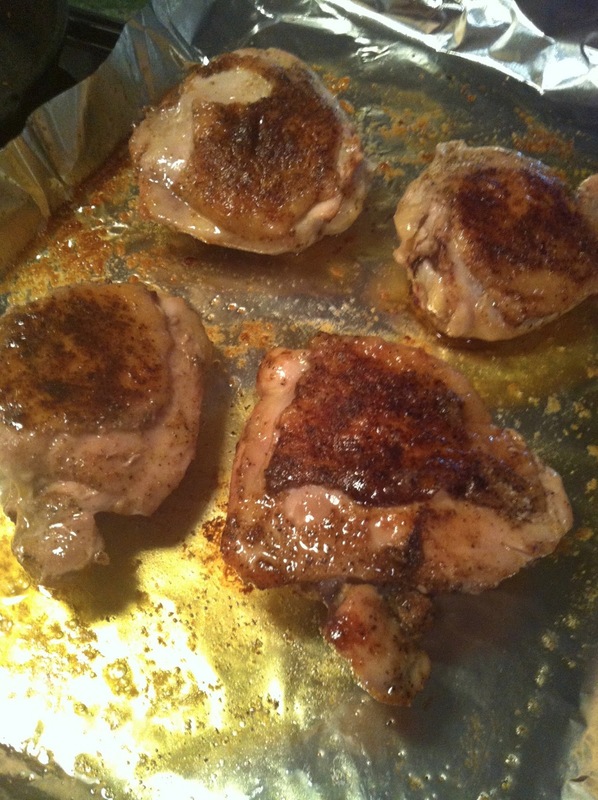 Place chicken skin-side down on a rimmed baking sheet. Add to oven on the BOTTOM rack. Roast for 22-25 minutes, or until the skin starts to brown along the bottom. Remove from oven and turn broiler onto high. Return to oven and broil until the skin is crisp, 3-5 minutes. Mm. Sometimes ya gotta have skin-on chicken. For a wonderful garnish/topping, make this simple sauce that I stupidly forgot to drizzle on before photographing. Mix about 2 tablespoons of plain greek yogurt with 1-2 tablespoons of almond milk (or coconut milk), a pinch of chile powder and a pinch of curry powder. Plate a scoop of chana saag and top with a crispy chicken thigh, then drizzle with the sauce. -Saute spinach in 1/2 tbsp olive oil over medium high heat until soft, about 5 minutes. Pour into a food processor. -To food processor, add jalapeños, garlic, and chicken broth. Puree. -Heat the other 1/2 tbsp of olive oil over medium high heat. Add the tomatoes and saute for about 5 minutes, crushing gently and creating a sauce. Reduce heat if needed. Stir in curry powder, chile powder, salt and pepper. 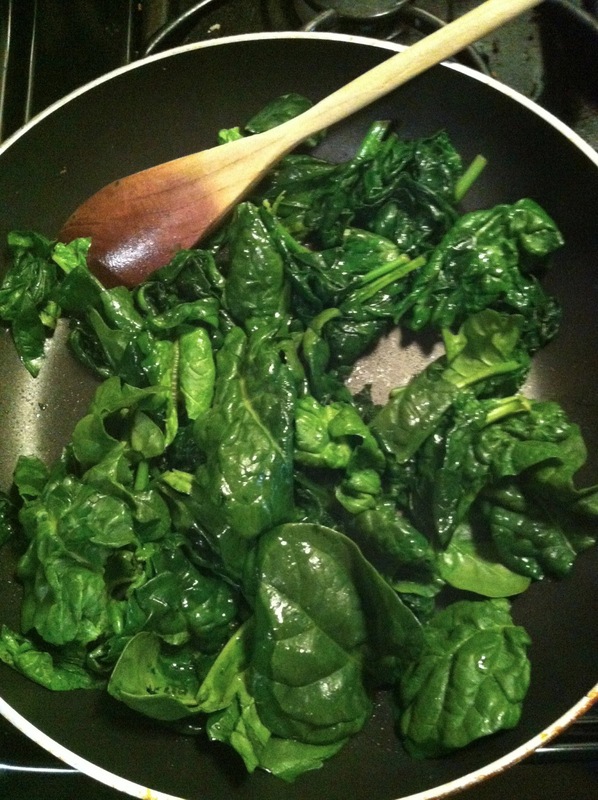 -Stir in the spinach puree. Bring to a simmer. -Stir in chickpeas. Let simmer for about 10 minutes. -Rub chicken with olive oil, then rub spice mixture over both sides of the chicken, focusing more of the spice on the skin side. 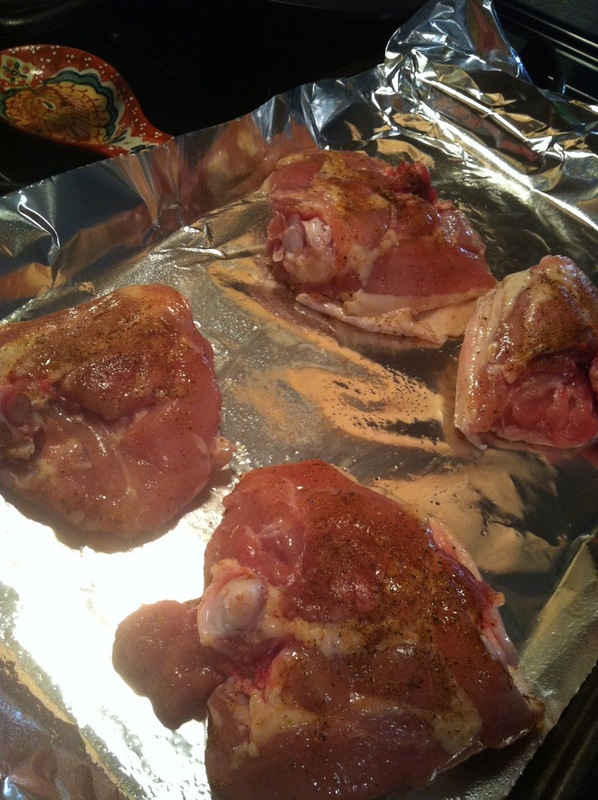 -Place the chicken skin side down on a foil-lined rimmed baking sheet. Put on bottom rack of oven and roast for 22-25 minutes, or until the skin starts to brown along the bottom. Remove from oven and turn broiler onto high. Return to oven and broil until the skin is crisp, 3-5 minutes. 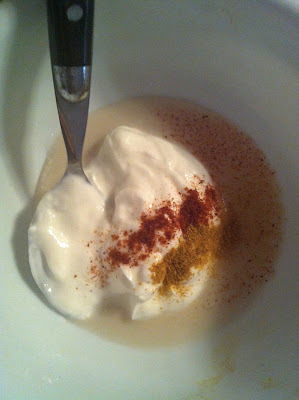 Mix yogurt with the spices. 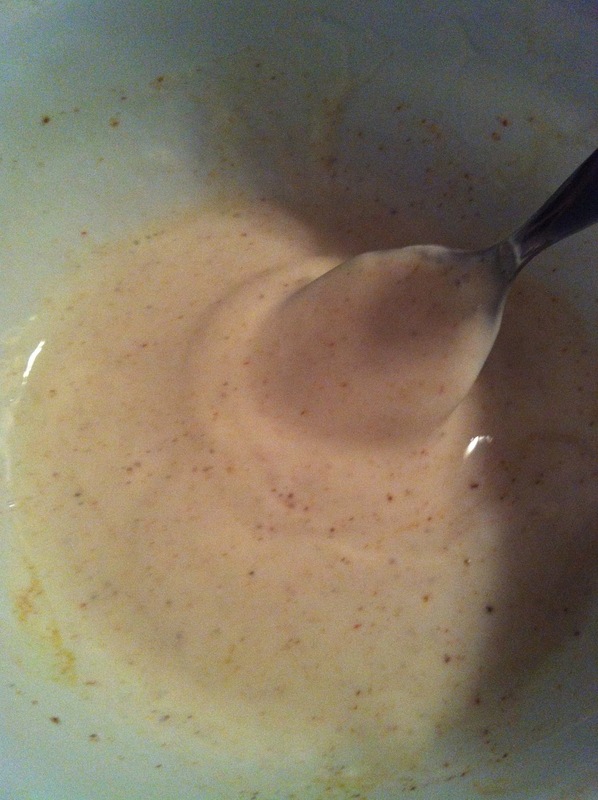 Stir in milk until desired consistency is reached. Plate garam masala. Top with a spiced chicken thigh. Drizzle with garnish sauce.